Use these great new kids prayer guides & scripture cards to teach your children how to pray Kingdom-minded prayers that change the world! 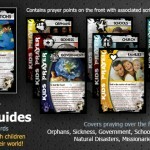 There are ten subjects covered with prayer points on the front and associated scriptures on the back. Sets include 1 of each card and are the size of collector cards so they are easy to carry around and store.